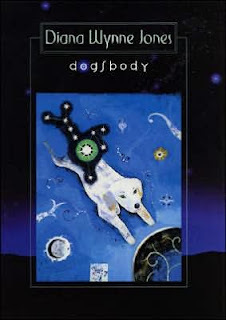 Last August, I read Diana Wynne Jones' Dogsbody for the first time and really enjoyed it. Even though it has only been eight months, I decided to re-read it when Tif chose it for her Tales to Tomes read-along for this month and also as my first Once Upon a Time choice. It has some interesting themes and situations and I wanted to read it more purposefully. There will be a discussion in the next few days on Tif's blog and on Twitter so I will save my plot thoughts for that (and you can read them in my previous post as well). Instead, I'll tell you briefly about my reading experience. I can't recall ever re-reading a book so soon after my original read-through and I was surprised to be able to better balance my interest in the plot with some more meaningful thought about the author's choices. I thought about the names chosen, the family structure, the depth of the politics discussed and so much more. Really, I can just say that I thought about the book, which I tend not to do too much. I am admittedly a plot reader and, as long as the author takes a sane route through their story, I mostly just go along for the ride. I wish that I had known that I was able to re-read a story so soon without being bored. This could have been helpful in school. I could have read the required books early and then read them more thoughtfully a second time when I had to write about them! Are you a purposeful reader or a plot reader? And have you ever re-read a book less than a year later? Was it a good or bad experience? Support our site and buy Dogsbody on Amazon or find it at your local library. We bought our own copy of this book. I reread constantly, especially short books, because I can pick them up and read them in a few hours and then go back to my longer books. So yes, I've reread a book in a short space of time. I am currently rereading The Secret History for the fourth time in a year (swear to God), and it has not yet palled. I'm afraid I may be overreading it now and that will render it unreadable to me in later years, like how you can use up land by planting too much stuff in it or whatever? But so far that hasn't happened. I love it as much as ever. I've just started reading Dogsbody for the first time, and it's the first Diana Wynne Jones book I've read, too. I would normally avoid re-reading a book less than a year after I first read it, because I can remember too much about it for it to be worthwhile. But I do re-read books, I usually leave a gap of over a year, preferably a few years - that way I don't have to concentrate on the plot but can focus more on how it was written, things I didn't notice the first time around etc. I am not a big rereader at all...and certainly not within the same year. I think I'm a plot reader like you though. Jenny - That's really interesting! I used to read like that, pick up my favorite books a couple times a year. I always compared it to the frequency of watching a favorite movie. I've been bad lately and I miss some of my favorites. Tracy - Oh, how lovely that you're finally trying DWJ! And my memory for books is actually rather short. I had even forgotten some of the plot of Dogsbody in these eight months. Jenners - I'm glad I'm not the only one! Eva - I can't wait to hear how your re-read goes, especially with F&H. That's one that needs at least a second and third reading anyway!